Cervetto's works, which constitute an important enrichment of the cello repertoire, represent the transitional period between the Baroque and the Classical eras in which the cello developed from a bass into a solo instrument. The present sonatas are ordered progressively. While the first sonatas are kept relatively easy, the later sonatas place greater technical and rhythmical demands on the player, but they remain with-in the compass of the bass and tenor clefs. 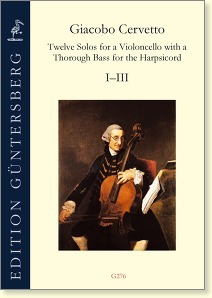 All of the sonatas are very well suited as duos for two cellos.